One of the aspects of the OJCL is service. Every year, each of the 3 regions (North, Central, South) have a service activity in October or November to help the local community as part of Make A Difference Day. 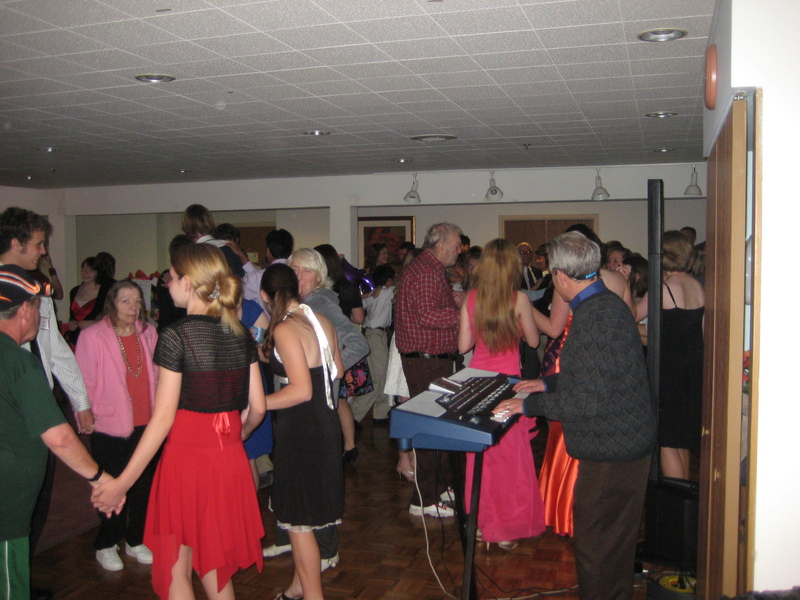 Events in past years have included: a prom for senior citizens at a retirement home, clean-up of debris at a historic cemetery after a severe wind storm, planting trees in a park dedicated to environmental education, and a Halloween festival for kids in need. In addition to MADD, the OJCL and local Latin clubs host several service events in which students can participate throughout the year. The Fall Service of the Season Contest results are here! On September 28, Madeira High School had, Day of Service, an annual trip devoted to serving the community across Cincinnati. 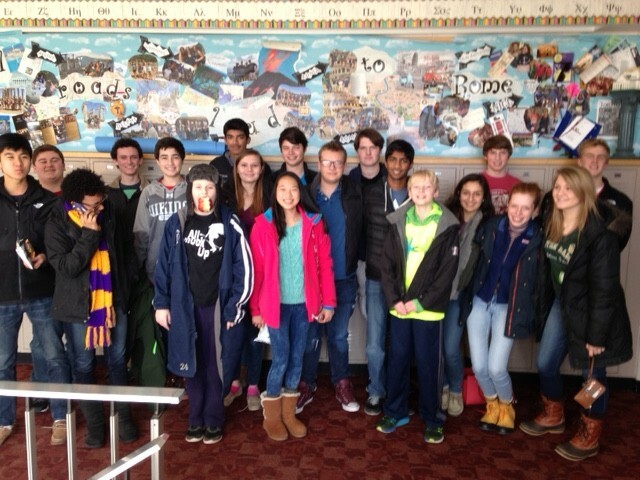 While most trips were comprised of 15-20 people, the Latin Club made the largest trip, bringing 50 students! On this day, the MJCL traveled to Gorman Heritage Farm. While visiting, there were many projects for the students to complete. They worked on mulching, digging drainage systems, and even harvesting potatoes (pictured). For the animal pens, they used wheelbarrows to deliver mulch to renew them. Then the students used rakes to spread the mulch, making them as good as new! Another group accomplished tasks such as digging ditches to create drainage systems. This was used to keep the water from spoiling the tomatoes growing nearby. Overall, this project helped establish and ease the work of maintaining this 122 acre, volunteer-based farm. Gorman Heritage Farm is dedicated to educating people about the importance of agriculture. Their vision for the future is to cultivate an informed community that helps support the farm and is passionate about agriculture. 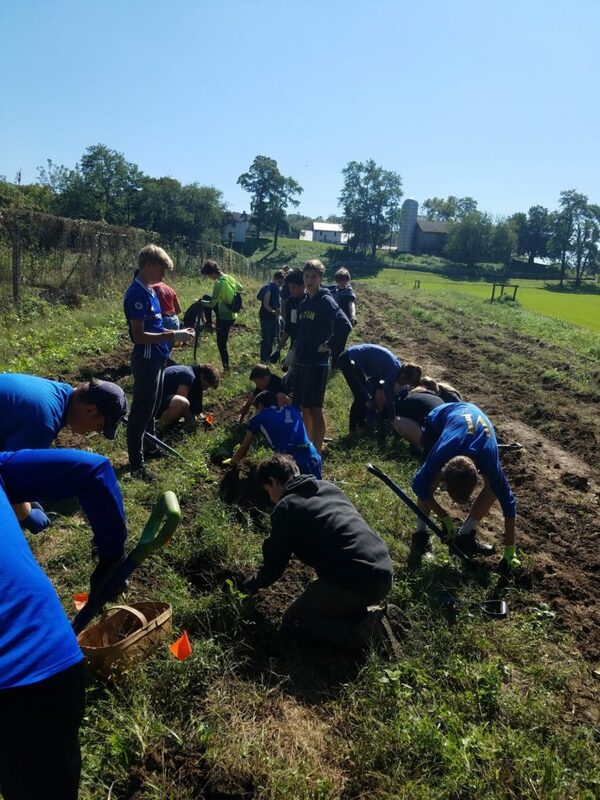 By sending these volunteers, the Madeira Latin Club was able to support this terrific organization by reducing the amount of labor that was needed for this harvest. Central Gubernator Ali Winter: On Saturday, November 10th, a group of 14 central region students volunteered at the Childhood League Center, an organization that donates children’s clothing and toys to disadvantaged families. We helped keep bins of clothing organized, kept the area clean, set everything back up after the event, and even got the chance to help a mother shop by holding her baby! Everyone had fun talking and working together. Thank you to everyone who came because you really did make a difference! 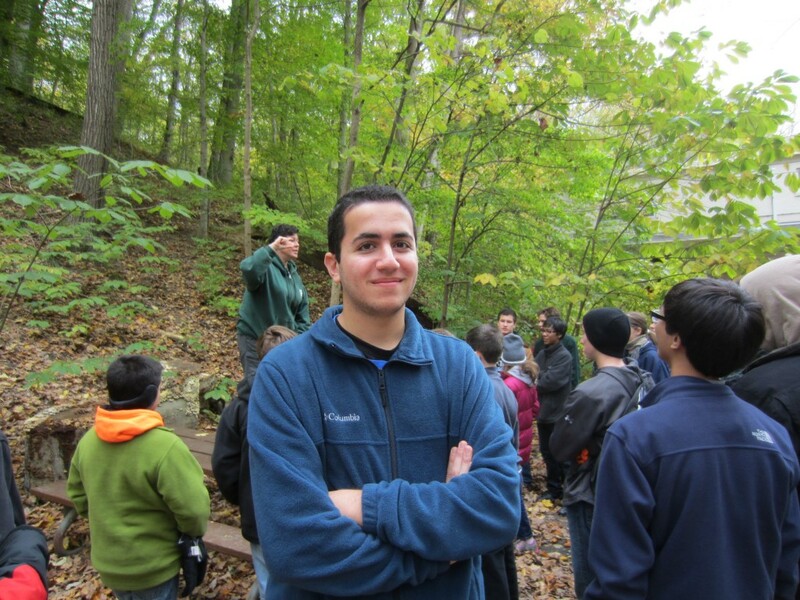 South Gubernator Ryan Burns: On October 20th, a group of 10 dedicated OJCLers volunteered at California Woods Nature Preserve. 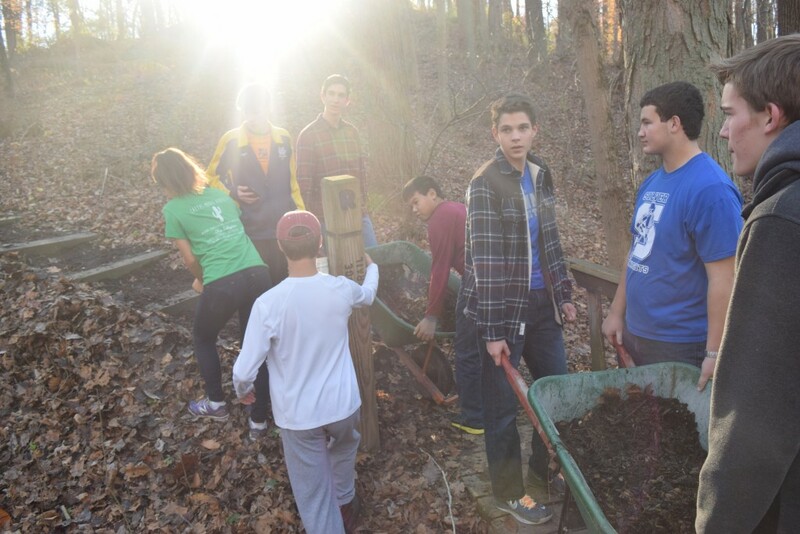 They worked hard throughout the day mulching trails, raking leaves, and overall helping restore beauty to the nature preserve. As a whole, the group restored an entire trail which will be used in December for a youth outdoors camp. Thank you to everyone who participated and worked hard at the event! North Gubernator Emma Davis: The North service event took place on May 19 at Hubbard Valley Park. Although there was a high chance of rain, the weather turned out lovely. Thirteen wonderful volunteers offered four hours of their time cleaning up the park and picnic area. We broke up into small groups of two or three and worked on different areas of the park before meeting back at the end for a pizza party! Many thanks to the volunteers and Magistra Sawan for attending the event. Overall, the OJCL left the park spotless. Central Gubernator Ali Winter: On Saturday, May 12, a snazzy group of eight OJCLers from the central region got together to volunteer at NNEMAP food pantry. We performed a variety of tasks: bagging dog and cat food into distributable portions, sorting cliff bars to be handed out, and scrubbing potatoes. Everyone had a great time hanging out and helping the community! Thanks to everyone who came and to NNEMAP food pantry for making this possible! South Gubernator Ryan Burns: On May 19, an amazing crew of about thirty southern OJCLers worked together at Hands Against Hunger packing meals for starving children. Each student performed an important piece of an assembly line packing the nutrient rich meals to be sent to needy children. Overall, with our work throughout the day, we helped feed about 100,000 children! Thanks to all the volunteers who worked hard throughout the event. Thank you so much to all the delegates that stopped by the service colloquia for Project Linus or Cards for Hospitalized Kids at convention! Together, we made 110 cards and used up all the blanket materials. In addition, coin wars donations raised over $250 for Project Linus and North Gubernator Owen Kranz was pied in the face because this goal was reached. Overall, the OJCL did a great job with service at the 2018 convention. Despite the snowstorm, OJCL students gathered at Columbus Academy on MLK day (1/15/18) to participate in Project Linus. After making quilt squares to be stiched into blankets, we had time to play a few Certamen matches. It was a fun way to stay warm and serve the community! On the blustery and cold morning of November 18th, Latin students from St. Edward High School and Shaker High School gathered to spread Thanksgiving cheer. At the Masonic Temple on Detroit Avenue, these students helped to pack 300 bags with various Thanksgiving meal essentials: pumpkin pie, turkey, stuffing etc. After then helping to load these bags and other non-perishable items into a multitude of cars, the students then paired up and personally delivered the food to Lakewood families. With three cars, the students were able to personally deliver over four hundred pounds of desperately needed food to 9 households. All said and done, the students made a difference for many households in Lakewood during the Thanksgiving season and personally spread some holiday cheer. On November 11th, the South MADD took place at California Woods Nature Preserve. 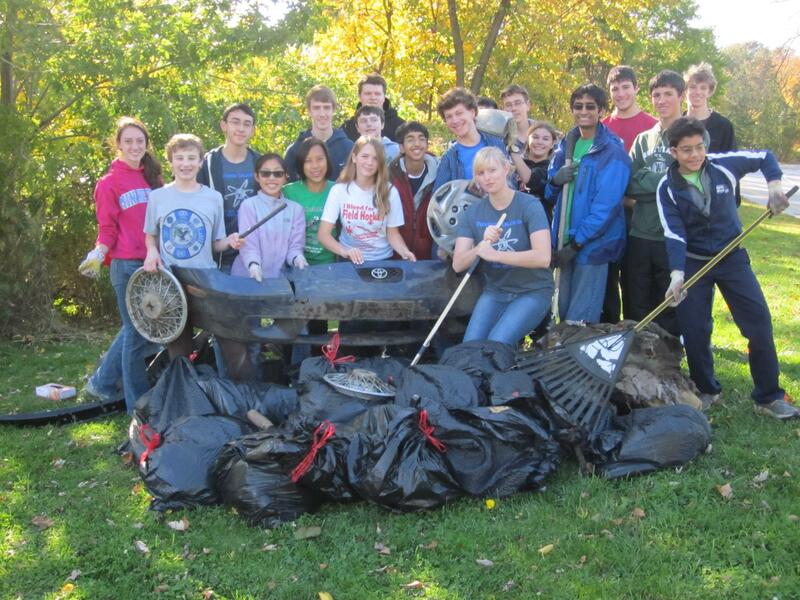 An amazing group of OJCLers came out to help the environment. At the parks, we raked and mulched two separate trails. While a bit chilly in the oudoors, we all pushed through and put in an excellent day’s work by fully cleaning and mulching two entire trails. Thanks to all of the hard working students who showed up, and a big thank you to California Woods for hosting us this year! On Saturday, September 30, several OJCL students from different central region schools volunteered at Nationwide Children’s Hospital Pumpkinpalooza event. 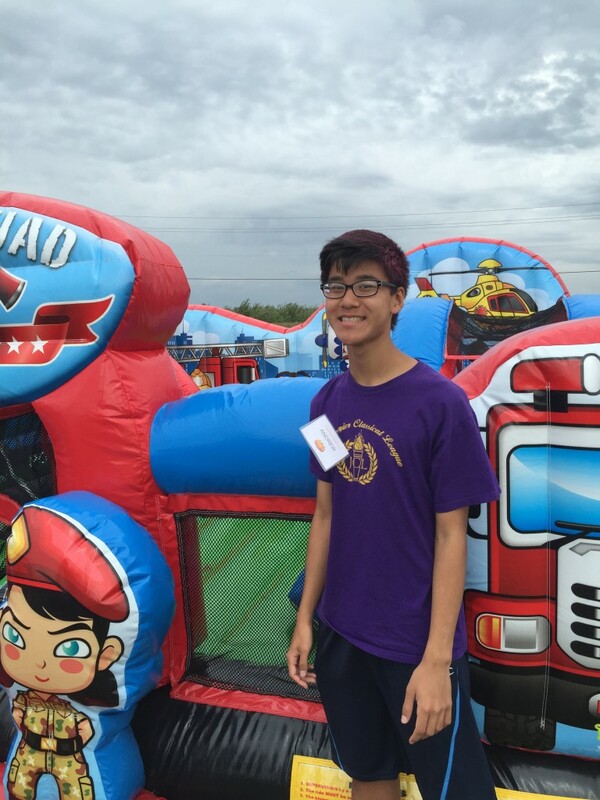 This fall-themed festival raised money for children in need through the hospital’s financial aid program, all while entertaining many with hay rides, bouncy houses, and boardwalk-style games. The volunteers helped run the event and make sure everything went smoothly for the visitors to enjoy the beautiful weather outdoors. On behalf of the OJCL, I would like to give a huge thank you to the event coordinators and all who were able to come out and participate! Central: September 30 at Nationwide Children’s Hospital’s Pumpkinpalooza from 12:30-4:30 PM. View the flier for more details! South: November 11 at California Woods Nature Preserve for trail preparation and habitat restoration. Please fill out this permission slip. | View the flier with more details! 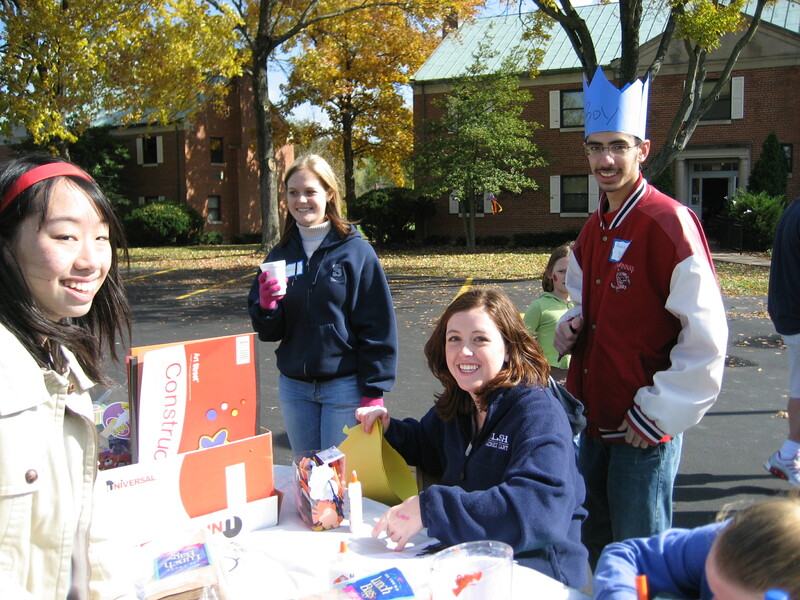 North: November 18 at King’s Church for packaging and distribution of food to families in need. View the flier for more details! North (NEW DATE): Horseshoe Lake Park on November 6. Central: Broad Streets Presbyterian Church on November 20. South: California Woods Nature Preserve on November 12. Contact person: Second Vice President Joseph Delamerced (vpres2@ojcl.org). On Sat April 16, 9-11 am, 10 Cincinnati area JCLers convened at Matthew 25 Ministries to do some awesome service work! 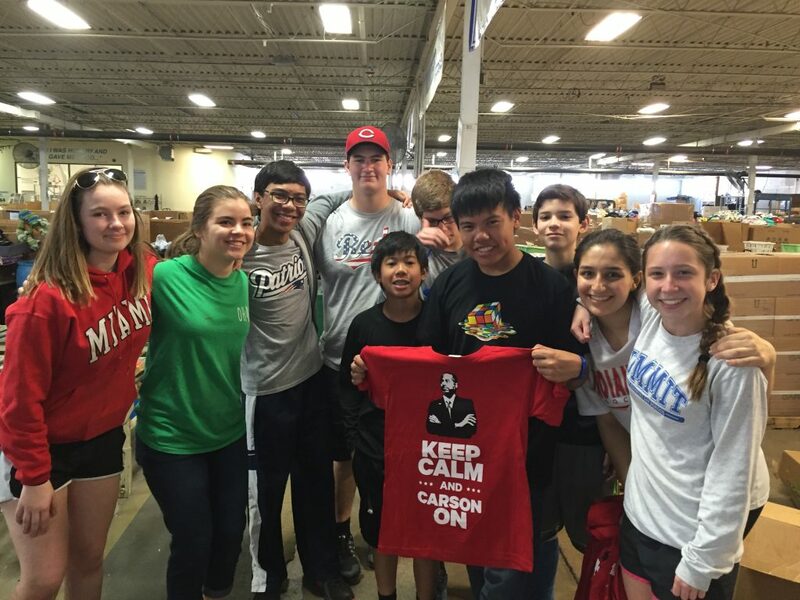 They organized clothing for the needy, and all the clothing happened to be donated Ben Carson campaign material! There were Carson T-shirts, onesies, and even scrubs. Everyone had lots of fun filling up crate after crate of Carson shirts. Go OJCL! 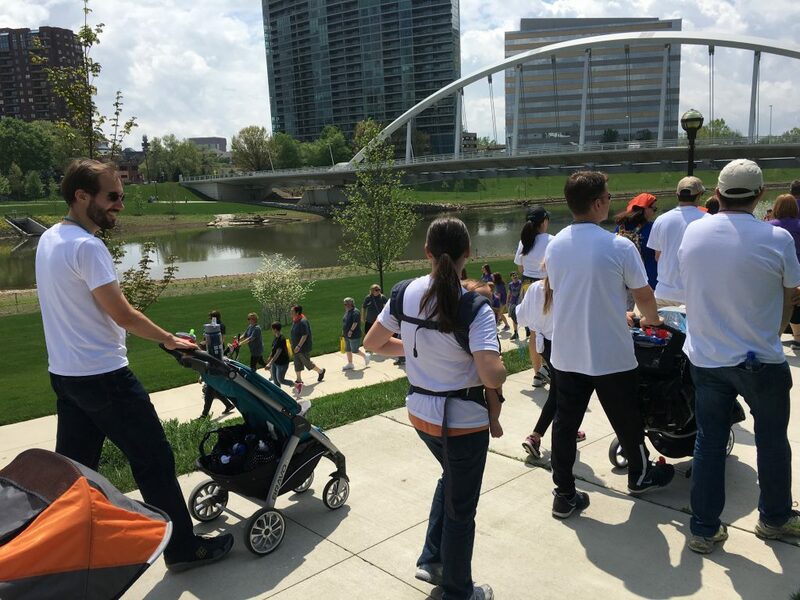 It is a 5K walk called Great Strides to help raise money for Cystic Fibrosis Foundation and to support people diagnosed with that disease. We have been invited to join team Mighty Micky for the walk. To participate you must register on the website (link below), it is preset to a donation of $200, but I suggest 10-20 dollars. South Gubernator Julia Dean (Summit) invites all Cincinnati Latin students to participate in a service activity at Matthew 25 (11060 Kenwood Rd, Blue Ash, OH 45242). YOU MUST SIGN UP ONLINE HERE! On Monday Jan 18 (MLK Day), more than 50 students from Columbus Academy, Turpin, Indian Hill, Granville, and Wellington came together for a fun day of drawing and coloring quilt squares to be stitched to blankets and donated as part of Project Linus. During the 90 minutes of work, we made more than 300 quilt squares, enough to make nearly 25 blankets. 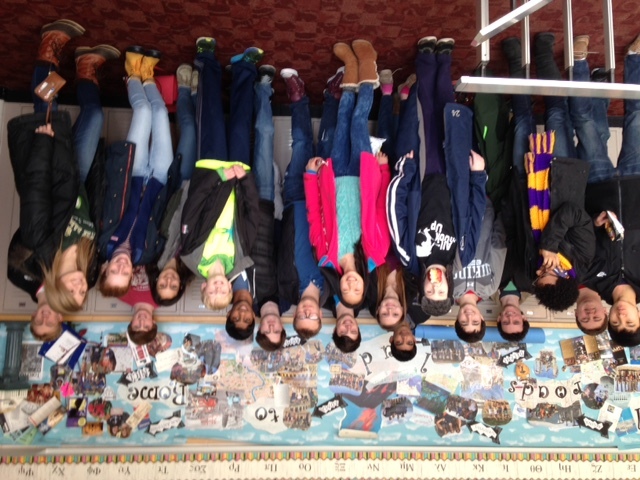 Afterwards, everyone stayed for a certamen event that included 4 randomly selected teams of all levels. On October 25, 2015, the NE and NW Regions held a joint Make a Difference Day Event at Laura’s Home – a division of the Cleveland City Mission that supports women and children. Approximately 15 students from Shaker Heights and Westlake came together to host a Halloween Celebration for the children at Laura’s home. More than 30 families came to enjoy the afternoon celebration. The event consisted of food, games, arts and crafts, music, and other festivities. The OJCLers that attended had a blast with the kids, many of whom were underprivileged. Overall, it was a great event! On November 14 2015, 26 students from seven Cincinnati schools gathered at California Woods Nature Preserve to clean up trails for Make a Difference Day. The group split in two. While one group, called the Honey Suckle Death Squad, worked to eliminate invasive species, the other group raked and re-mulched a trail that was used for a park event on December 5th. It was a great day to serve others and the OJCLers came through! 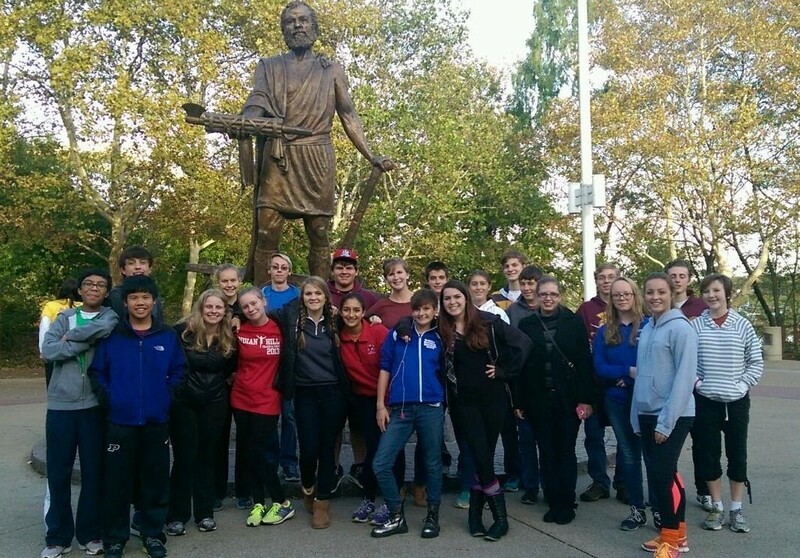 On November 21 2015, a small group of OJCLers went down to Saint Vincent de Paul’s location in downtown Cincinnati. 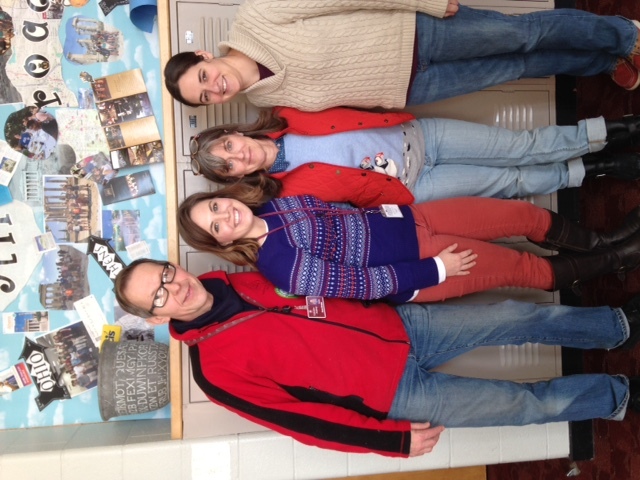 They worked on organizing the fresh donations of coats for the coat drives throughout the winter season. They worked so quickly, that they were sent to make pancakes for families waiting in line at the food pantry. After cleaning up, there was nothing left to do and the power group was sent home early with smiles. On Saturday, September 19th 2015, 26 students representing Granville, Wellington, and Columbus Academy attended the Central region Make a Difference Day event at the Nationwide Childrens’ Hospital Pumpkinpalooza. 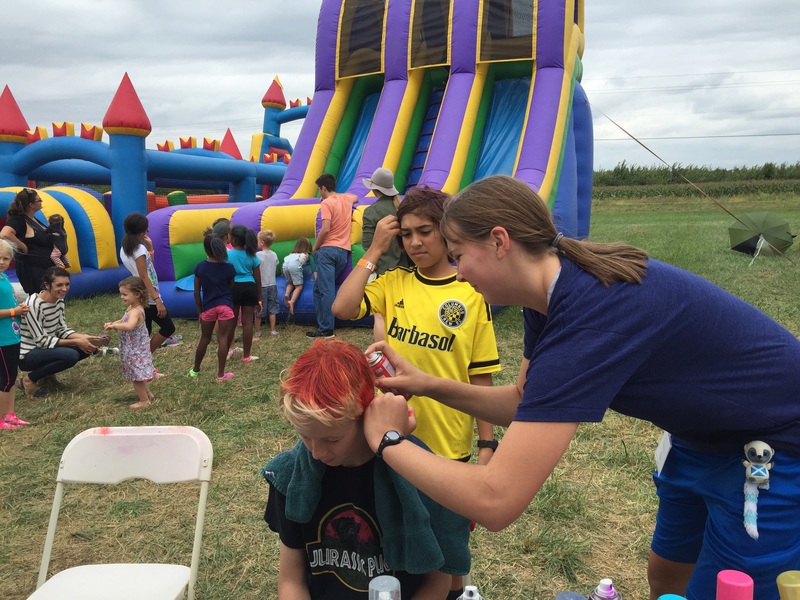 JCLers from all over the Columbus area helped run the event at Lynd’s Fruit Farm to raise funds for the inpatient rehabilitation center at the hospital. From monitoring toddlers in the bounce houses to coloring with little kids, the day was both meaningful and fun for everyone. 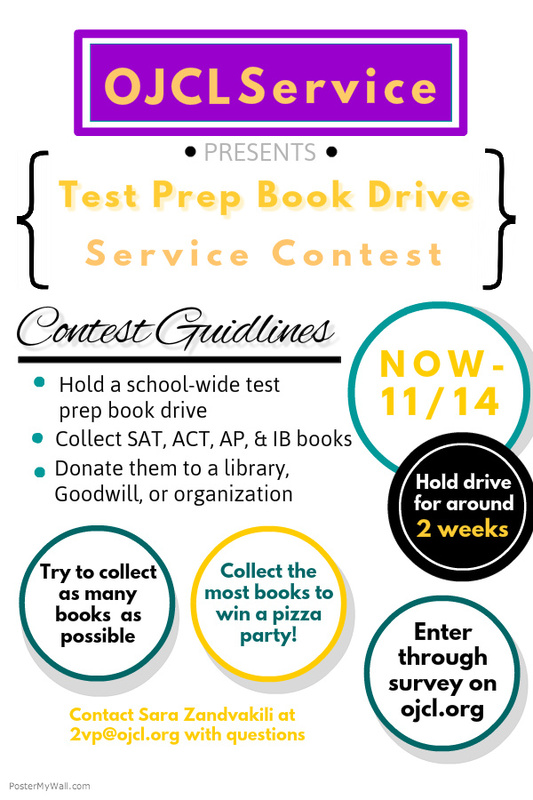 The OJCL is sponsoring a SAT/ACT/IB Test Prep Book Drive. Flier with info is here. Click here for the online submission, due Nov 14. The Latin Club which donates the most books wins $100 for a pizza party! Contact 2nd VP Sara Zandvakili (2vp@ojcl.org) with questions. (10-14-15). 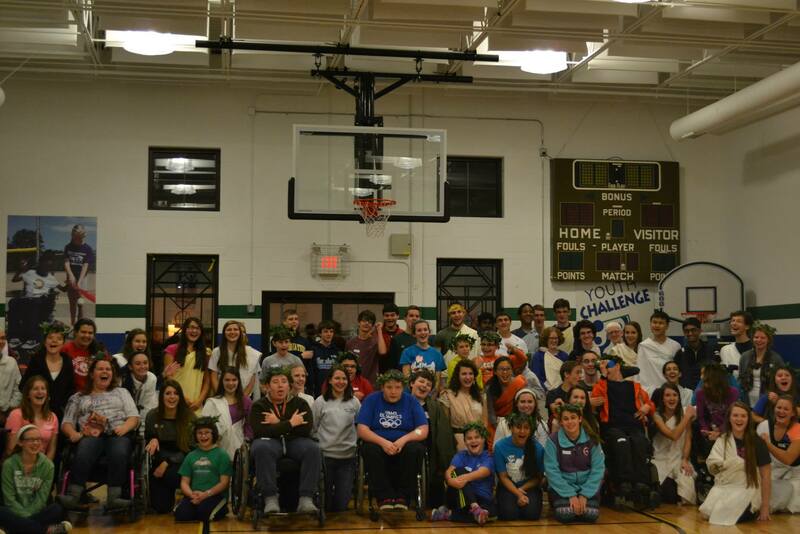 On Valentine’s Day McAuley High School is hosting a Roaming Romans’ Togathon. Our togathon is modeled on the Relay for Life and will raise money for Latin education. We will be supporting Saint Peter Claver Latin School for Boys. SPC is located in the Over-the-Rhine area of Cincinnati and runs completely on donations. They are a K-8 school and are dedicated to help their students be accepted into higher ranking high schools than those of their school district. They are looking to expand their Latin program. These funds will help them to do so greatly. Our togathon is set for February 14th from 1-5 PM. People may start arriving at 12:30 to sign in. Official events will begin at 1:15 after an introduction to the event. Besides walking a set route through the school, the students will have the opportunity to partake in many other service events including Project Linus and Cards of Courage. There will also be fun games, costing a quarter per round. We ask that every club comes up with a toga theme. The best dressed team will earn a special prize. We also ask that every participant raises at least $10 for SPC. As an added incentive, the individual and the team that has raised the most funds will earn a prize. Every club is one team. On Sunday, October 19th 2014, the OJCL teamed up to participate in the ‘Out of the Darkness’ community walk for the American Foundation for Suicide Prevention. 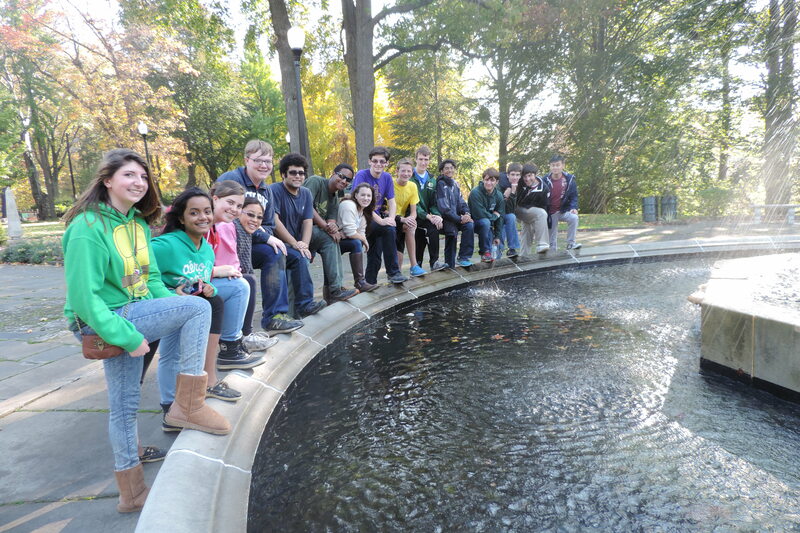 More than 40 Latin students from 7 different schools met up at Sawyer Point, helping raise donations past our goal of $500. Altogether, OJCL’ers contributed a great sum of money for the foundation and had a great time supporting at the event. 2013 has been an absolutely amazing year of service for the OJCL. Together we have helped so many around us and spent many hours giving back to our schools, cities and states. And when I say many hours, I mean many MANY hours. Across the OJCL I received service hours from ten schools spread out across Ohio. While this is a good number it is only a third of the chapters in the OJCL, and I know that every chapter is involved in service in one way or another. That is why I am presenting a challenge. By next year I’d like to see that number at least double for the upcoming First Vice-President. I know you all can do it. Across the ten schools that submitted service hours we totaled 1,787 hours with an hours per capita average of 5.1 hours. With all those total hours you can tell that we were busy. Those many hours were invested in many projects including our three regional MADDS, Project Linus, Christmas gift wraps, Relay for Life, disaster relief projects, and many more projects. Overall this has been a great year for service and we have done so much. However, there is always room to grow. I’d love to see those 20 schools submit their service hours for the 2013-2014 year. Just imagine how much those numbers above would grow if everyone was included. Let’s make this upcoming year even more amazing for service in the OJCL. On November 16th, OJCLers from the Northeast and Northwest regions joined together for an “Olympic Day” at Youth Challenge. Youth Challenge is a nonprofit organization that brings together children with physical disabilities and volunteers for adapted sports and recreational activities. 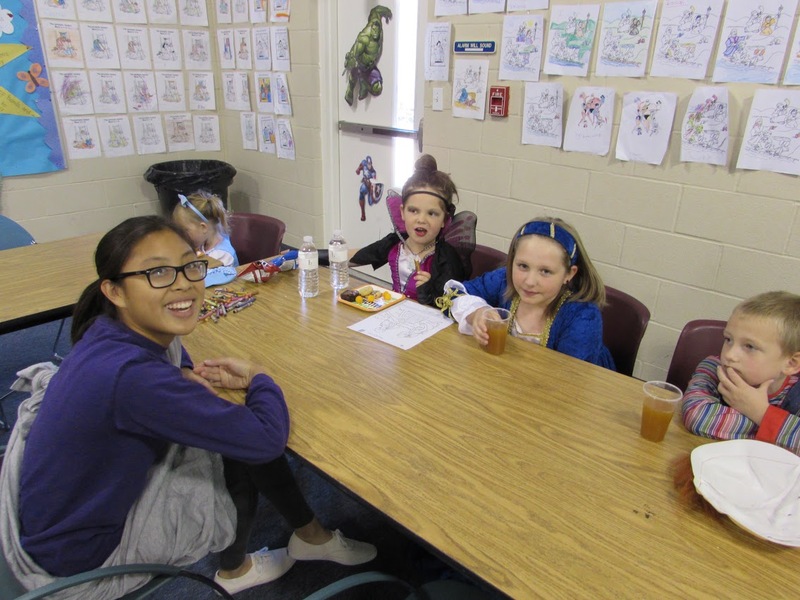 OJCLers dressed in togas and led fun activities for the YC participants, such as chariot racing (using their wheelchairs as chariots), javelin throwing (using pool noodles as javelins), and fresco painting, giving brief historical blurbs before each event. At the end of the night, there was a closing ceremony where all of the YC participants were crowned with laurel wreaths and given grape juice and crackers (to simulate Roman wine and bread). Thank you so much to everyone who came and helped out! 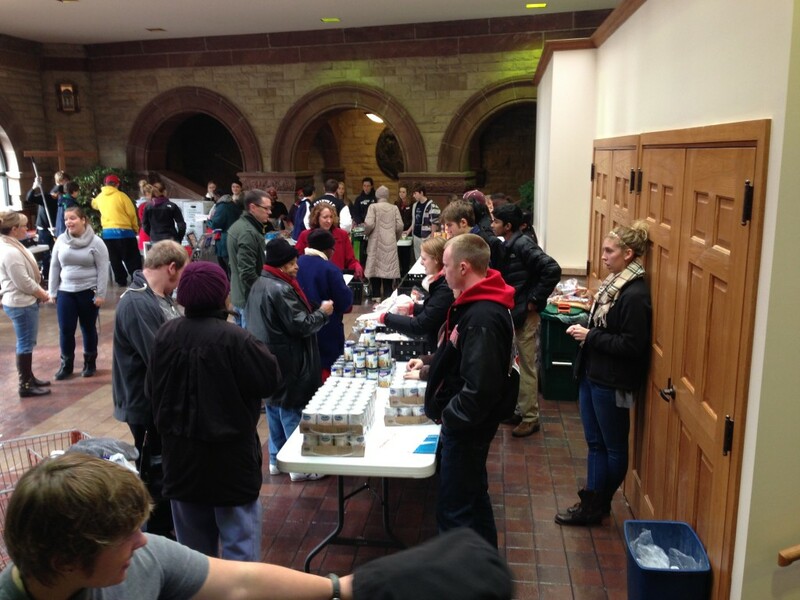 Each Thanksgiving, the Broad Street Food Pantry in Downtown Columbus supplies enough food for a complete Thanksgiving feast to 150 needy families in neighborhoods surrounding the Broad Street Presbyterian Church, and for the second year in a row, students from the Central Region helped make the 2013 project a success. Despite the frigid temperatures, students and their advisors began arriving around 8:30 a.m. the morning of Saturday, November 23, to help Food Pantry staff and other volunteers prepare for the annual Thanksgiving food give-away. 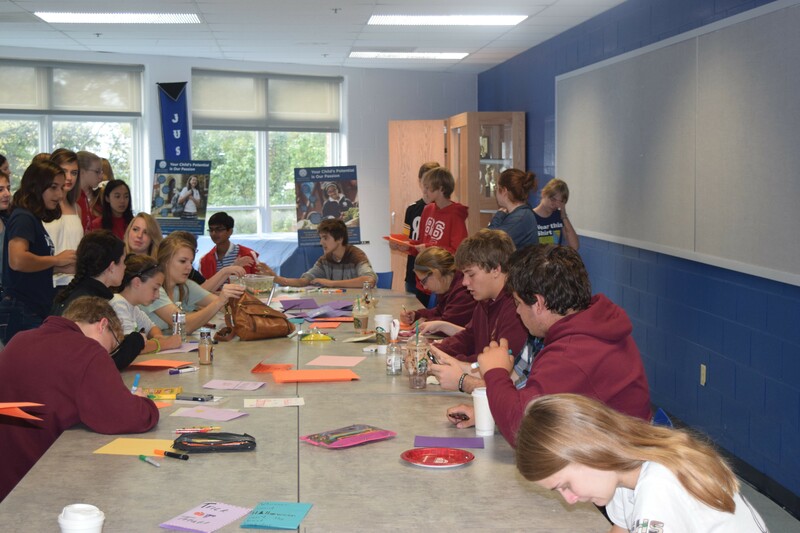 It was the Region’s Make a Difference Day and approximately 50 students volunteered their time that morning. People had begun lining up outside in the cold much earlier, so everyone jumped into action to get the food lines set up. Students immediately began helping setting up tables in an assembly line, unpacking food items and making trips to the recycling bin. Once set-up was complete, students split up among different food stations and helped families fill their carts with vegetables, broth, cranberries and turkeys. One group of students assisted families transport the food from the church to their cars in carts. Afterward, students helped with clean-up, which included pushing brooms and taking more trips to the recycling bins and trash receptacles. The Food Pantry is one of the largest food donation stations in Columbus, providing a five-day supply of food to 30 families daily. Twice a month from May to October, the pantry provides additional fresh produce to 200 families. Director Kathy Kelly Long appreciated the support provided by the Central Region. “Your group was great to work with,” she said. I would like to thank everyone who came out to the Southwest Regional MADD. A great deal of work was accomplished to clean up the environment at California Woods Natural Preservation. I even received a call back from the people at California Woods, thanking us for all the work that we did. Around 50-55 people showed up. In addition to all the hard work, many new members of the OJCL attended. It was an awesome experience, and it was great to see everyone again! Hope to see you at State Convention! BELOW IS A RECAP OF THE OJCL SERVICE FROM THE 2012-2013 YEAR. Many chapters committed significant time to community service this year. Seven chapters – Brookwood, Columbus Academy, Lakota West, Madeira, McAuley, Wellington, and Woodridge – logged and submitted their hours on time for the Service Contest. The work of the 350 dedicated JCLers that comprise these chapters was absolutely phenomenal, and totaled to exactly 800 hours of service work since last year’s OJCL convention. This included work done at the three Make a Difference Days, our annual regional service events, and time spent on numerous other local projects during the year. 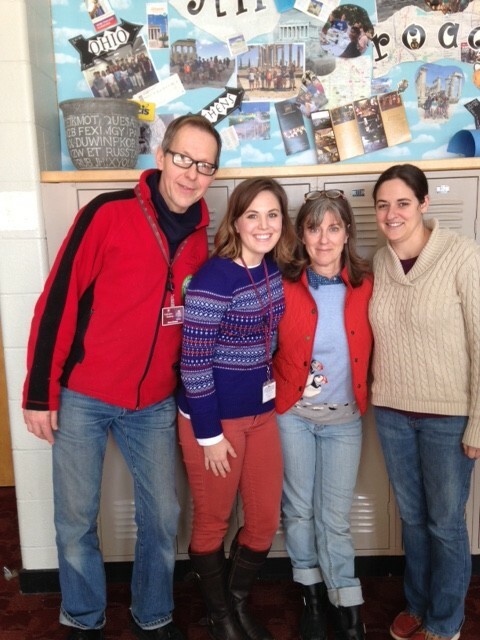 For example, 93 Madeira students helped out with recycling at their school over the course of the year, 40 Lakota West students made holiday cards for veterans in December, and 23 Columbus Academy students prepped fleece fabric to be made into blankets for disadvantaged children in January. Work done at the latter will be continued at the OJCL convention on March 9th, allowing the OJCL to bridge the gap between pre-convention service work and at-convention group activities. Thanks to all who submitted their service hours, and start thinking about some exciting projects for next year! “The OJCL, putting sharp objects into the hands of kids since 2012.” Now, it’s not as dangerous as it sounds. In October 2012, over 55 students from the Southwest region of the OJCL volunteered at the California Woods Nature Preserve to help clean the park in preparation for the coming winter. The students armed with various weapons made their trek into the trail and raked, chopped, and threw greenery to their hearts’ desire. After a long day of work they unwound with cookies and some good times with friends. Columbus Latin students distribute food at the Broad Street Food Pantry. E Pluribus Unum. From the many schools of the Central Belt, one united band of providers of good descended on the Broad Street Presbyterian Church Food Pantry (BSFP) to distribute much needed Thanksgiving foodstuff to those less fortunate. It began as a simple project. I, your humble gubernator, was exchanging emails with the many volunteer organizations around central Ohio when I received a message suggesting that the OJCL test drive a massive new Thanksgiving-themed food distribution project with the BSFP. The result? Twenty students from Columbus Academy, Granville, and BCLC gathered at 7:50 am on November 17, 2012 prepared to do whatever necessary to assist the BSFP and its patrons. The need was obvious as we witnessed a line that stretched around the city block, teeming with people from all walks of life braving the frigid cold, many having arrived as early as 5:00 am. Over the course of several hours, the Latinists of the Central Belt carried boxes, helped patrons, sorted several thousand variations of cranberry sauce, and handled over 5,000 pounds of surprisingly wet produce (sorry Columbus Academy). Ultimately, it was a beneficial endeavor for all. Some 1,000 hungry citizens of the Columbus area were able to return to their homes laden with goods for delicious and healthy Thanksgiving dinners. And that says nothing about the worthwhile experience for us. It was fantastic to be able to interact with people outside of our daily routine, and it gave us a new perspective on what we had to be thankful for during that time of year. On October 21st, twenty dedicated OJCL members took part in an adventure all its own. That adventure was the Northern Ohio Make a Difference Day. 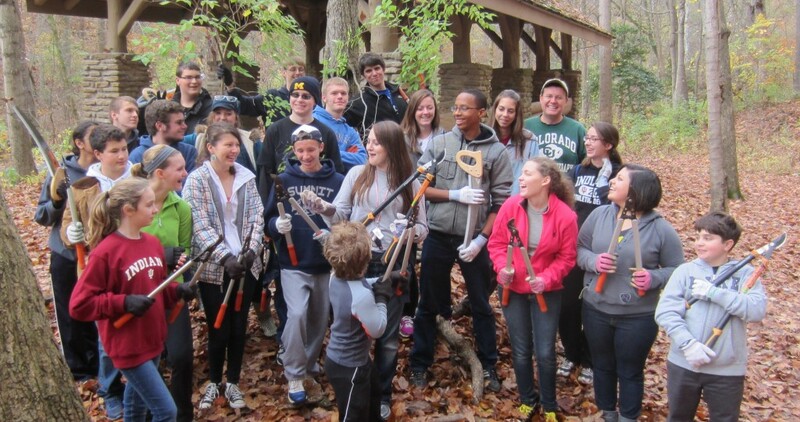 Those twenty brave OJCL’ers journeyed into the woods at Cleveland’s Edgewater Park for a trash clean up. Four hours, seventeen bags of trash, and many car parts later the group had finished. After completely overflowing the dumpster with the trash the group took several pictures and parted ways, ending a very successful MADD. To all those brave souls, Narayan and I would like to say thank you once again for all your hard work. Without all of you that day would not have been as successful and fun as it was!